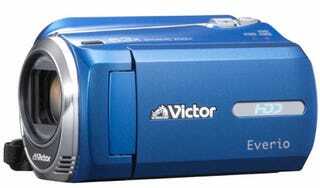 Three New JVC Everio Camcorders, Still Remember What They Are, Flash Camcorder Users? I've always been fond of JVC Everio camcorders, but with the latest round of pocketcams grabbing attention for far too long, it's about time we reverted back to a model with a decent sensor. The GZ-MG980, GZ-MS230 and the GZ-MS210 have been announced for the Japanese market under the Victor JVC branding, with US pricing and availability expected to be confirmed at CES. With a 10.7-megapixel, 1/6-inch CCD sensor, the video on the GZ-M980 isn't quite full HD at just 720 x 480 resolution, though the 39x (F1.8 - 4.3) optical zoom and 80GB HDD are pretty decent. An SD/SDHC slot rounds it off.